This video falls under the category of things we want to send people when they ask “how do I get started with electronics”, and we get asked that a lot. For those of you who have been working with electronics for years at all, you can skip this entire video. That is, unless you really want to watch an instructional video on multimeters. In the video, which we’ve included after the break, they talk about the differences between different meters, the common uses and how to actually use the meter to get the results you need. Stuffed full of useful information, this video will get those of you who are still reading up to snuff pretty quickly. 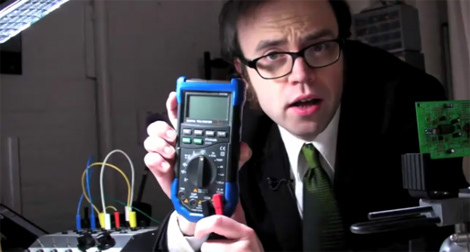 Now go use your multimeter to do some hacking! Just need to watch the EEV blog. Dave reviews a slew of them in Part 1, and Part 2. Fix the embed… Two wide to fit in the body div AND the open in youtube button/link is hidden. Smooth. Although I learned all this stuff a long time ago, I love his videos, he makes it really easy to understand. I’m with @Hackius too. They are hard to understand at first, and a make-style video would have helped me out a lot. Hmm O-scopes are kind of hard to understand if you’ve never used them.. I learned using them in school during fysics, electronics and electrics class.. Neither of them showed us more than what we really needed but in total it did result in enough knowledge to understand the total package..
i saw this earlier today, wonderful. infact watch any of this guys docos. And perhaps we can find or make a viddy about Simpson 260 or similar meters? I have a black case Amprobe analog that gets used rather often as unlike the new digital flukes etc- it’s a no battery needed meter. I can never stand this guy or his attempts at the Agent Smith voice. Totally agree. Can’t the guy just talk normal like the rest of the human race? Talking like Agent Smith is only cool in the movies. As a n00b, thanks. Just in time. I’m getting started with a cantenna for wiki and hope to move onto an Arduino hack. This guy is a total dude. I’d have a zoot and a beer with him any day. This guy makes me want to slap him. +1 for Dave Jones @ EEVblog. He’s become something of a test equipment connoisseur.